Interested authors should submit a 500 word abstract via email to rferdig AT gmail.com. After review by the issue editors, authors will be invited to submit original scholarly papers of 4000-8000 words (including footnotes, references, and appendices) via the JVWR publishing system (see www.jvwreserach.org > About JVWR > For Authors). Shorter manuscripts are preferred. Longer ones are optional and should be discussed with the issue editors. Accepted papers will be published online in Volume 10, Number 2 (2017) of the Journal. Full papers will be reviewed by expert referees using the JVWR double-open policy. Double-open policy means that in general, authors do not need to anonymize their papers, and reviewers' identity is also known to authors. For more details about it see JVWR site --> About JVWR --> For Authors --> Our double-Open Policy. 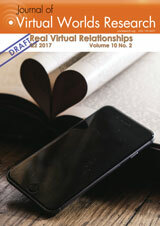 The Journal of Virtual Worlds Research (#TheJVWR) (http://www.jvwresearch.org/) is an online, open access academic journal that engages a wide spectrum of scholarship. We welcome contributions from the many disciplines and approaches that intersect with virtual worlds' research.